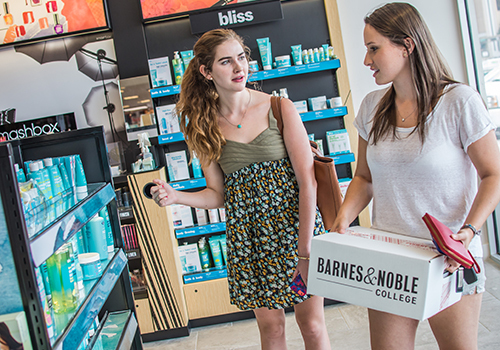 While building its reputation as a leader in campus retailing, Barnes & Noble College has been examining the broader issue of how its 748 nationwide stores can further enhance its in-store offerings to benefit its campus partners. Key to that process has been an understanding of how the stores fit into the life of the campuses they serve, as Karen Sweeney, Vice President, Store Operations for Barnes & Noble College, explains. “If you think about the life cycle of that student, we’re there for freshmen orientation, we’re there for their first Rush, and we’re there to help them celebrate all the milestones through to graduation — and we’re still going to be part of the campus when they come back as alumni for homecoming and football games,” she says. That enviable position is hardly something Barnes & Noble College takes for granted, but rather fuels a determination to create in their bookstores a destination where the campus community visits often — and where it loves to shop. 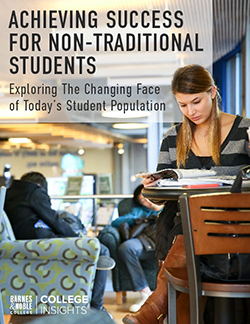 Understanding students’ needs, from the perspective of their shopping and social expectations, has been key to Barnes & Noble Colleges’ development as a campus hub. In fact, the company’s ongoing research panel has revealed that even the highly digitally-connected Millennial generation maintains a preference for the in-store shopping experience. Giving students more reasons to visit their campus bookstore — and more often — has instilled in managers a desire to constantly change things up at their stores, presenting an environment that is always relevant and constantly evolving. 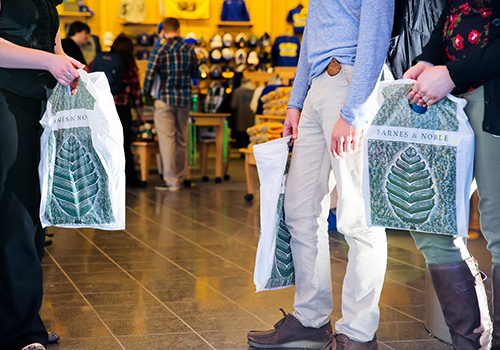 As a result, stores are continually testing new products and innovative merchandising ideas to bring new retail experiences to the college campus. In the past, the company has successfully introduced cafés and convenience food items, technology and apparel, and a product category that particularly intrigued Lisa Mazzio, Director of Merchandise for Barnes & Noble College — health and beauty. “We’ve introduced brands like Clinique and Burt’s Bees in a number of our stores and those brands have performed well, but we’ve always believed there was a greater opportunity to grow the cosmetics sector,” she explains. That curiosity has led to testing a new beauty-store-within-a-bookstore concept dubbed The Glossary. 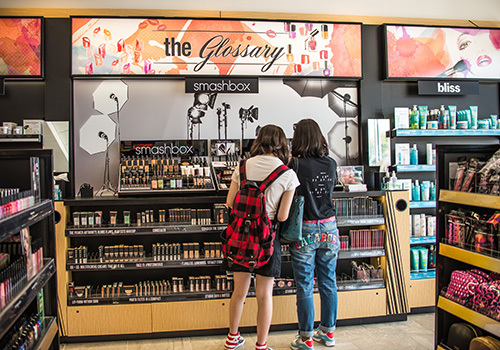 Designed to be an accessible and unique setting within the college store, The Glossary offers an invitation for customers to stop, try and test new products in a casual way rather than the more curated setting of the department store cosmetics counter. “The level of research Barnes & Noble College has put into this, and their understanding of how the college audience might respond to the category is impressive,” remarks Mark Scott, President & CEO of S. Mark Scott, a prestige health and beauty brands distributor who was instrumental in helping develop the concept. Offering a range of high-fashion and on-trend brands such as Smashbox, Philosophy skincare, Bliss Spa products, Lipstick Queen and Butter London, the concept has been introduced in a limited number of stores as a test market to put another key product category within the reach of the college campus. “As we go forward, we want to be able to add, evolve and change the product mix in our Glossary stores to keep the destination fresh and exciting,” Mazzio says. What students want is also a place of belonging on the campus, which is where the bookstore also plays an increasingly vital social function. With a string of successful in-store events such as VIP Nights and DeStress Fest events that tie the store firmly into the collective fabric of the university campus, the bookstore is emerging as a social hub in addition to its more traditional retail role. “We don’t want the store to be a place you visit to rent your textbooks and then return them at the end of the year,” Vostok explains. “What we’re creating is the idea of the store as a year-round destination with new and authentic reasons to come through our doors,” she says. Just as important as what’s happening in-store is an understanding of the changing ways students like to pay for their purchases. In an acknowledgement of student preferences for more convenient check-outs for example, Barnes & Noble College now accepts all mobile wallet platforms such as Visa Checkout, Apple Pay and MasterCard Express for online purchases. Last year, Barnes & Noble College launched their Bookstore App, providing customers with even more ways to shop the store remotely. Designing a store around the customer is a concept that Barnes & Noble College shoppers seem to appreciate. Recent research illustrates that 80 percent of students maintain that their bookstore has a good sense of what their needs are, while another 80 percent agree their campus bookstore is part of their community. “We look at it as a seamless experience that ties everything together,” explains Vostok. “We’re presenting a cohesive story that we can build through our digital channels, our in-store experience or even through a satellite pop-up location — you can interact with the store in any way you most prefer,” she says.